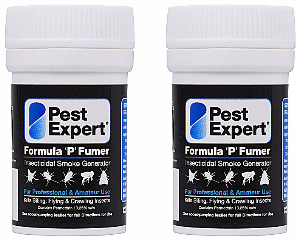 Pest Expert Formula 'P' Fumer Flea Bombs are a flea-killing fumigation device for eradicating dog and cat flea infestations and are an essential part of any flea treatment. Leave no residue on carpets or furniture. The Pest Expert Formula 'P' Flea Bomb is a highly effective flea-killing fumigation device that is an essential part of any comprehensive flea treatment. After lighting, it releases a permethrin smoke which fumigates a room, killing adult dog and cat fleas. Once dispersed the smoke leaves no residue, so will not taint or damage carpets or furniture. A twinpack of Flea Bombs is sufficient to treat an average size room of approx 4m x 3m. To treat more widespread infestations, add extra twinpacks as necessary. Contain Permethrin at 13.25% w/w. Make the area to be fumigated as smoke tight as possible by closing all windows, doors etc. Place smoke bomb(s) on a heat-resistant surface, for example a biscuit tin lid or an old plate. Handle with care after use as they can become quite hot. Light the fuse and vacate the room/area. Leave for at least 2-3 hours for the smoke to disperse and then ventilate the room thoroughly. NB We would recommend wearing a safety mask when using this product. The Formula 'P' Flea Bomb is best used in combination with a residual insecticide such as Pest Expert Formula 'C' Flea Spray for longer-lasting control. For value for money, please see our Flea Kits which contain a range of our best products. Brilliant just what I wanted 👍🏼 First-class service, fast delivery and item as described. Will always use Pest-Expert, the smoke bomb worked incredibly well and I am flea free again! Website clear, Goods arrived on time and so far a lot less fleas to be seen! Really pleased with my purchase! Ordered on Tuesday, received the bombs on Wednesday! By Wednesday night there were no more fleas! Fantastic stuff! Brilliant service all round! The smoke bombs ignited quickly and killed the flea in the living room - good price too! Before purchasing any products I called the helpline to be given amazing advice and confidence in the product purchased. Very good prompt service quality products. Will use again. Product described accurately, reasonably priced. Quick delivery well packaged just as described. Would use company again. The choice of supplies is explained very well to enable you to choose the right method of pest control. I particularly appreciated the guidance on proper treatment to lessen suffering. Also very good communications with regard to delivery. Easy to use website with good explanations of the products. Sensible prices and next day delivery as stated. Absolutely fabulous. Did the job 100%. Highly recommend it. Good website easy to use and delivery was excellent. Products were great value for money definitely use this website again excellent all round service. Good web site, easy to find the products and information that you need, plus the product that i purchased works very well, the pricing is also a great plus. Overall, delivery is timed and tracked, a great company to deal with and a great shopping experience. Really fast delivery and product works! great products, great prices, great service. Asked a few questions via web chat and they were clear with the advice and were reassuring on my needs. Items arrived the following day, very pleased. Excellent product. Good value for money and delivered as stated. The service I received was-brilliant and I would recommend this company to anyone who wants any of their products, from ordering to receiving the product was only two days, brilliant. Does what it says on the tin, good effective products delivered on time. Great service and delivery ,very helpful if phoned too!! Excellent service, goods exactly as described and delivered in good time. All the product and treatment information found within our website has been checked and approved by our own technical team, so you can be assured of both professional guidance and specialist products.